FORT HOOD, TX — Folks in Bell County got all dressed up and headed to Temple for a good cause Friday night. 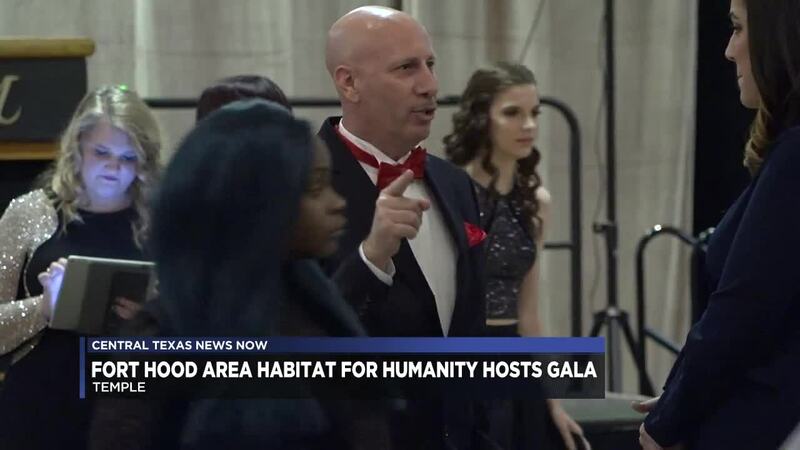 The Fort Hood Area Habitat for Humanity celebrated its 25th anniversary and hosted their first ever gala to kick off their fundraising event for the year. City officials and community members from all over Bell County gathered in Temple to show their support for Habitat for Humanity and enjoy gourmet food, entertainment and a silent auction. Fort Hood Area Habitat for Humanity CEO and Executive Director Ken Cates said Friday night’s event would help raise money, but it also gave them a chance to make a big announcement. “We have a table here recognizing the inaugural year of Harker Heights High School’s Habitat for Humanity campus chapter and it’s the first in Central Texas. The next closest high school level chapter is south of Austin,” said Cates. Due to timing, the Harker Heights High School’s program will be added to next year’s budget. Fort Hood Area Habitat for Humanity hoped to raise at least $10,000 at tonight's event.